For Back Pain, Few Easy Answers on Surgery Americans get surgery for lower-back pain at a higher rate than any other country. Whether that's too many, too few -- or just right -- is a hotly debated subject in orthopedics. At the center of the debate is how to decide who should get surgery for lower back pain. A series on why the spine is so prone to problems, and the current word on treatment. WHY THE BACK FAILS: Find out why the back is so prone to injury. Thank you for your questions on back pain. We can't answer all of them and are forwarding a selection to back-pain expert Dr. James Weinstein. Check back Thursday, March 9, to read his responses. Weinstein is chair of orthopedics at the Dartmouth-Hitchcock Medical Center and professor of orthopedic surgery and community and family medicine at Dartmouth Medical School. Americans get surgery for lower-back pain at a higher rate than any other country. Whether that's too many, too few -- or just right -- is a hotly debated subject in orthopedics. At the center of the debate is how to decide who should get surgery for lower back pain. Noah Hano, a 34-year-old real estate broker and amateur triathlete, has had back problems for almost 20 years. The first time he hurt his back was when he was 17 and working in a grocery store. "I went to go lift a box and something popped, and it was about three or four days of not being able to function or move," says Hano. Peter Griffin, a 37-year-old organic farmer, has also had back pain for many years. "The last six or eight months, my back pain increased sharply," says Griffin. "It went from being a bad pain to a worse pain." Griffin said he couldn't sit or bend over -- a tough situation for a vegetable farmer. Each consulted Dartmouth Medical School's Dr. James Weinstein, one of the nation's leading experts on back pain. In fact, Weinstein has had back pain himself. "I couldn't believe it. I was in the post office, getting my mail, bending over to my post office box, and I couldn't get up," Weinstein recalls. "I said, 'This couldn't be happening to me. I'm supposed to be the expert.' And I had to crawl from parking meter to parking meter to get back to my car." Weinstein's diagnosis for Hano and Griffin was straightforward: Each had a herniated disk. But knowing that didn't make the treatment decision easy. "When somebody has a broken hip, it's not a tossup," says Weinstein. "You have the surgery. If you hurt your back, that's a tossup, because there are all kinds of treatments." 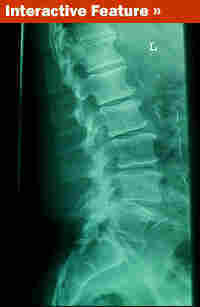 There's a spinal fusion, where the vertebrae are fused together. In a discectomy, part of the leaking disk is removed. Then there's a laminectomy, which frees up a pinched nerve. Or patients could choose no surgery at all, with a combination of watchful waiting and working through the pain. Weinstein wouldn't tell his patients what to do. "He specifically said he didn't want to make a recommendation," says Griffin. Griffin and Hano were given two studies to review. That's all the information there really is to offer right now, says Weinstein. One is a 20-year-old publication from Norway showing that one year after consulting an orthopedist, 36 percent of people who didn't have surgery saw improvement compared with almost twice as many who had surgery. But at 10 years out, the numbers were about equal. Hano, who decided not to have surgery, thought about the 10-year number. "For me, that was all I needed to hear," he says. "As long as I could continue to function and there was hope I could recover, I was going to take the nonsurgical route." Hano has occasional pain, but it's not stopping him; he's training for an Ironman triathlon. Griffin heard the one-year number: "If I didn't have small children that I needed to chase after and lift on my shoulders, I might have made a different decision. I might have given the back more time." Orthopedic surgeons and neurosurgeons across the country are facing the same issue as Weinstein. Orthopedic surgeon John Starr performs back surgeries at Washington Hospital Center in Washington, D.C. 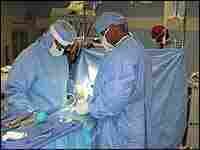 He says that, in many cases, doing back surgery is easier than deciding whether back surgery should be done. "I don't have the answer for the vast majority of patients," Starr says. "I have alternatives, and with those, I'll hope to find the answer." The bottom line right now: Patients need to be involved in deciding whether to have surgery. Weinstein says it may even help their outcome, whatever they decide. Weinstein is heading a federally financed study of 1,200 patients with chronic lower-back pain to compare the benefits of surgery and nonsurgery. Results are due this summer. A 1983 study in the journal 'Spine,' by H. Weber: "Lumbar disc herniation. A controlled, prospective study with ten years of observation." A 2005 study in the journal 'Spine,' by S.J. Atlas, R.B. Keller et al. : "Long-term outcomes of surgical and nonsurgical management of sciatica secondary to a lumbar disc herniation: 10 year results from the Maine lumbar spine study."